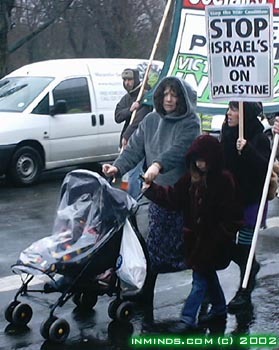 On a wet and windy Saturday hundreds marched, united in solidarity with Palestine and against Israeli terrorism. 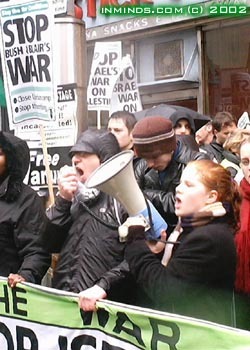 The march starting near the Albert Hall in London and progressed to the Israeli embassy in Kensington, demanding an end to "Israel's war on Palestine". the passion of the protesters. The turnout was good, considering the extreme weather with umbrellas buckling in the gale winds and the rain soaking through the tightest waterproofs. Only one aspect of the turnout was of noticeable disappointment - the lack of Muslim presence. Perhaps only one in seven present was a Muslim. Where were the Muslims? Relaxed in a warm room? we will ALL be asked. 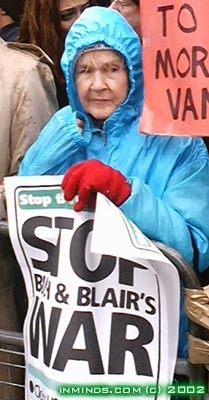 "Stop Bush & Blairs War"
The demonstration was joined by the "Free Vanunu" vigil, held outside the Israeli embassy every Saturday for the last 10 years. Mordechai Vanunu was a technician at israels Dimona nuclear installation when in 1985 he discovered the plant was secretly producing nuclear weapons. 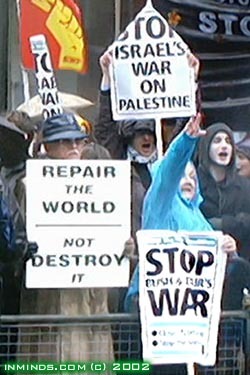 He left israel and broke the story to the Sunday Times, his photos and evidence showed that israel had stockpiled 200 nuclear warheads. 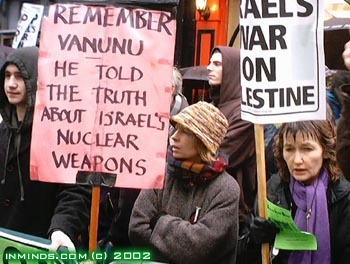 Shimon Peres, the father of Israel's nuclear programme (which started in 1956), was furious and ordered Vanunus kidnapping. On 30th Sept 1986, days before the Sunday Times story was published Vanunu was lured from London to Rome by a female Mossad agent/prostitute (Cheryl Ben Tov codename Cindy, maiden name Cheryl Hanin). 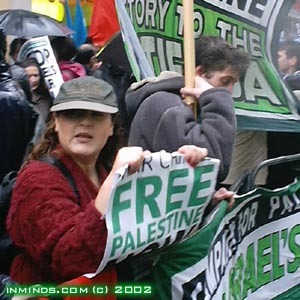 Cheryl had entered the UK in her sister-in-laws name Cynthia Hanin and used Cythia's vacant apartment in Rome where Vanunu was kidnapped, drugged, boxed and shipped to israel as diplomatic cargo (which ment the authorities could not inspect it). 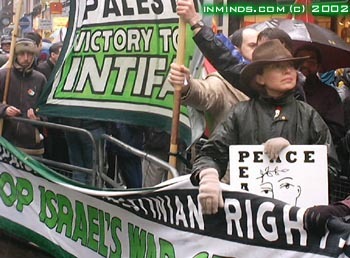 Once in israel, he was sentenced to 18 years of solitary confinement for treason. 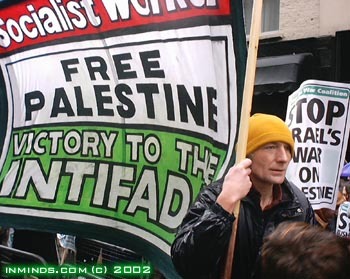 "Free Palestine, Victory to the Intifada"
reads the Socialist Workers banner. 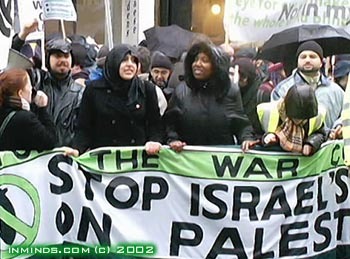 Perhaps this is the best lesson Muslims can take away from this demonstration - there are many non-Muslims out there that share our revulsion of israel and its policies against the Palestinians, and their numbers are growing daily. We need to actively seek them out and unite with them on these common human rights issues.